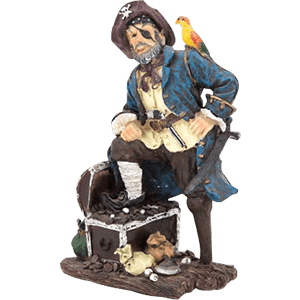 Show off your personal style in your home or office with the help of the stunning statues and figurines that you will find here! 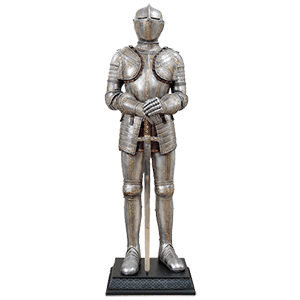 Our array of medieval and fantasy sculptures comes in a range of sizes and themes that work great as desk accents, shelf decor, and mantelpiece ornaments. Made from fine materials like resin, bronze, marble, and stone, these pieces possess fine appearances that are sure to impress friends and acquaintances with their craftsmanship. 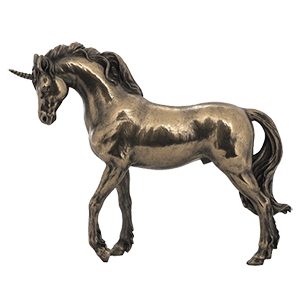 Find the perfect fantasy touch with our dragon, unicorn, Greenman, and fairy statues. 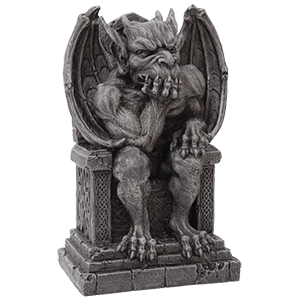 Or add a gothic vibe to your decor with our gargoyle, skeleton, and skull figurines. Alternately, enjoy medieval flair with our angel and knight sculptures. No matter what style you choose, we have the ideal accent for your taste, so be sure to take a moment to browse our selection! Dragons have long been a common symbol of the Middle Ages, and we pride ourselves on offering an absolutely staggering selection of dragon products featuring traditional and non-traditional dragons inspired by myth, legend, and fantasy from across the globe, in all manner of different forms suited for home decor and collection. The most common type of dragon pictured is based on the typical European dragon, which is descended from myths and images found in Greek mythology. This creature is a grand, pseudo-reptilian beast that features a fearsome countenance and has gradually evolved to possess long wings for flight, an elongated jaw for biting, and a serpentine tail for smashing. The other style of dragon is the oriental dragon, which is more serpentine and usually is depicted as wingless and benevolent. 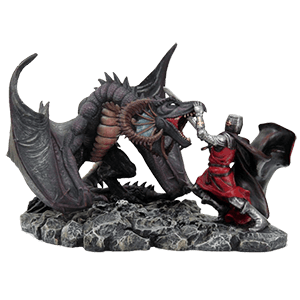 Much of our own dragon merchandise, whether it is a dragon statue, a dragon figurine, a dragon box, a dragon book, a dragon lamp, or a dragon clock, is crafted from cold cast resin and features an impressive level of detail. 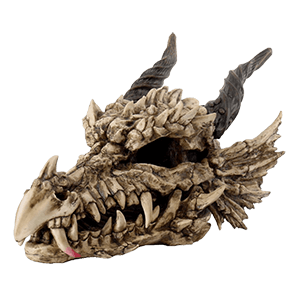 If you are a collector, our selection of statues and figurines is nothing short of staggering, as is our variety of dragon items, including dragon accents such as dragon wind chimes, dragon mirrors, dragon lamps, and other dragon home decor items. We also offer dragon t-shirts here so that the collector and enthusiast can easily find their next favorite dragon apparel item to wear wherever they go and whenever they want. The long and the short of it is that you will find all of our dragon merchandise and gear here. The greenman has been around for centuries, although his exact origin is not exactly well-known. He has been used in Christian carvings, pagan designs, and more throughout the centuries, making this design a fairly well-traveled one. We offer a number of great greenman styled items for anyone and everyone to enjoy. The typical greenman is fairly non-specific in design, typically only consisting of a face as it peers through some amount of foliage. In fact, this is one of the few consistencies between specific greenmen, as they always have something to do with foliage and nature. Sometimes the foliage is separate, sometimes it is merging with the face, and other times, the face is made up of the same foliage that surrounds it. Our various greenman items come in a wide variety of styles and designs, and that is not just referencing how many different items the greenman appear on. Some of the greenman designs you will find here are happy, and others are sad or even furious. Others are simply faces surrounded by leaves, while others are figures of bark, leaves, and vines, as much a creature of nature as a man. This ensures that no matter what style of greenman you want or whatever emotion you want it to feature, you can likely find it here, and on a variety of objects, too. So if you want a greenman journal to hold all your thoughts, writings, and drawings, you can pick that up here. 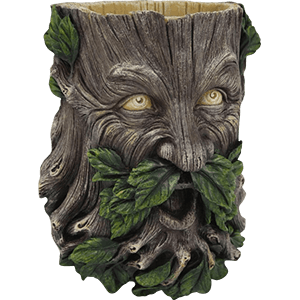 Or if you want a greenman to sooth you with the sounds of trickling water, you will want to pick up one of our greenman fountains. A greenman tankard is the perfect cup to enjoy beverages from, provided you do not mind the foliate man watching as you drink, just as greenman tiles and scrolls are perfect for putting on display on the walls, shelves, and tables of your home. Shop all greenman statues and collectibles here. There is beauty in the bones, and nowhere is that more apparent than in our selection of skeleton and skull statues and collectibles. Bring a touch of deathly gothic style to your decor by adding some human, and some non-human, skulls to your decorating scheme. And better yet, our skulls and skeletons come in a variety of different forms and functions, making them great choices for a variety of uses. We offer skull banks for those who need to store money and change safely and securely, as well as skull lamps and skull candle holders. And for the purist, nothing beats our selection of skull heads, where you will find skulls of every shape and style, including plain skulls, tattooed skulls, monster skulls, fanged skulls, colored skulls, and more! We also offer skeleton statues and skeletal home accents that depict more bones than just the head, often recreating the whole skeletal frame in shocking and intriguing ways as skeletal incense burners, skeleton ashtrays, skeleton clocks, skeleton lamps, or even skeleton pillows. For those looking to wear skeleton style, we also carry skull and skeleton t-shirts. There is a little bit of everything here in this skeletons and skulls category, and as you take the time to browse it, do not be surprised if you find yourself opening up to the idea of showing off some skulls or bones in your decor! If you are looking to spruce up your decorating scheme with timeless yet meaningful style, then perhaps you should check out our Celtic statues and collectibles. Not only will you find a number of attractive pieces, including Celtic crosses, statues, displays, and more, but each one is perfect for any home decor style. 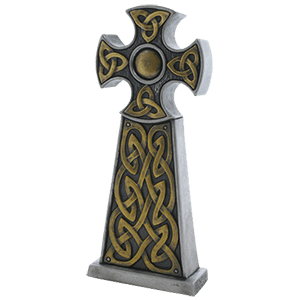 Here you will find an incredible variety of Celtic collectibles to fill your home or office. Our Celtic statues are show stopping pieces that depict the gods and goddesses of ancient Celtic culture, often with beautiful bronze finishes. Celtic crosses, in particular, are classic examples of Celtic home decor at its finest, and they easily fit into even modern home decor. We offer a variety of items decorated with Celtic knotwork, from Celtic wall plaques to Celtic bookends, Celtic trinket boxes, mirrors, and even Celtic ashtrays.  In this category, you will also find Celtic tree of life statues and home accents as well as Celtic dragon decor. We even offer stately Celtic tables, chairs, blankets, and pillows. So if you are looking to redecorate and want to use a bit more Celtic style in your life, whether you are at the home or at the office, our Celtic statues and collectibles are perfect for sprucing up a contemporary decorating scheme or creating a beautiful Celtic display. Are you looking to include a little bit more of the dark forces in your life? Then there is no better way to do so then with our gothic statues and collectibles. Here you will find all manner of gothic statues, gothic decor items, and gothic gifts that are sure to infuse dark decadence into your life and style. A cursory glance at this section will tell you that you are in for a dark and spooky ride, as all of the items you will find here are one hundred percent gothic in as many ways as are physically possible. Given that gothic material can be very broad, our selection is just as diverse, enabling you to craft your very own gothic style using a mixture of different pieces, ranging from gothic statues that are perfect for collecting and display to Alchemy Gothic posters that will transform any wall into a gothic display. In the same line of thinking, our metal plaques and gothic mirrors are great for decorating walls, while vases, candles, and even the odd gothic fairy will be a novel touch to display on your desk or table. And of course, no gothic display would be complete without including a good raven or two, as this sinister bird is very nearly the spokes-animal for gothic style. 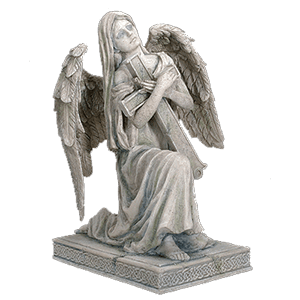 Whether you are decorating your whole home or office in true gothic fashion or just infusing that subtle touch of personal interest into your living or work space, you are sure to find the decorations to do just that when you browse through our diverse selection of gothic statues and collectibles. If some fantasy tales are to be believed, a whole new world lies beneath the ocean waves. You need not journey to the sea to witness this realm, though. Simply dive into our selection of mermaid statues and collectibles! 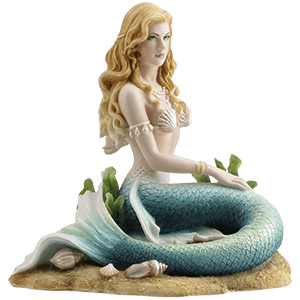 Witness the magic and the fantasy of these aquatic myths and legends through the collectible mermaid statues and mermaid home decor found here. This section is dedicated to all the undersea dwellers we have, ranging from slight twists on the typical mermaid myth to more iconic images of undersea beauty. Our mermaid statues are all made from quality materials, ranging from fine resins and polystone to cast bronze resins and metals. Some even show the mermaids as they commune with other elements, including mermaids alongside sea dragons, dolphins, and even alongside humans! We do not just offer mermaid statues and sculptures, though. We also offer an array of other mermaid home decor pieces, like trinket boxes, candle holders, trays, stands, plaques, mirrors, and beyond. We even have some mermaid bags available! No matter the style of mermaid item you need, you are sure to find a mermaid statue or collectible here that will perfectly bring a touch of undersea fantasy to your decor. We are home to a host of angels. No, not the kinds that fly through the air, but rather a host of heavenly religious statues that depict several different angels, some named and some unnamed. 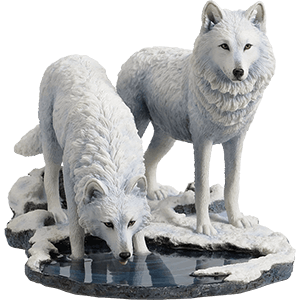 These statues are stunningly detailed and great decorations to have decorating your personal abode. Of course, religion itself covers a diverse array of topics, and so our religious statues are quite diverse as well. You will find more than just angels here. Those who follow the tenants of Christianity will find many statues of Jesus Christ and Mary here, echoing scenes of faith and love. There are also a number of angelic statues here. Some are peaceful and serene, while others are fearsome warriors that smite evil with their divine prowess, such as each of our St. Michael statues. Of course, Christianity is not the only faith, and so you will also find a smattering of other statues here, some of which relate to faith in general, including such pieces as the creation of man and various statues of various saints. 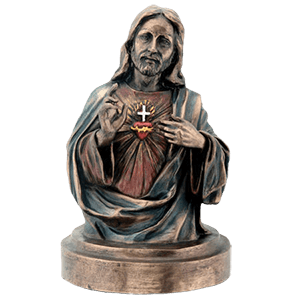 You will also find statues of figures from other religions that exist across the globe, or that existed once in history, in our religious statues and collectibles category. The steampunk revolution is here, my friends. We pride ourselves on offering a wide assortment of the most cutting edge steampunk tech available! This means that when you are looking to show off how steampunk savvy you are, you can get your steampunk decor here and be confident that you are displaying only the finest of all things steampunk. 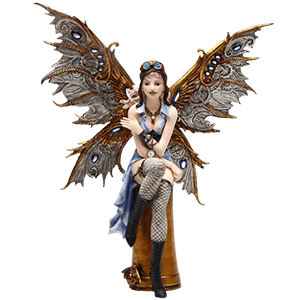 You will find all of our steampunk statues, collectibles, and home decor here. As is typical of steampunk tech, many of our pieces of steampunk decor featured here look like an amalgamation of different pieces of technology from a variety of different sources. We offer replica steampunk firearms, some of which are fresh, steam-powered takes on Old Western pistols, while others are impressive new designs that are one-hundred percent totally steampunk in origin. And whether you want a steampunk replica revolver or a rifle, you can rest assured that we have both. Other impressive items in our collection of available Steampunk gear includes impressive pieces of wall decor ranging from steampunk clocks that look like they are powered by steam and gears to elegant steampunk trinket boxes that will keep your precious trinkets locked away in steampunk security. Our steampunk statues offer glimpses into the people, creatures, and inventions that populate worlds of steam, many appearing as though constructed from gears, gizmos, and gadgets to possess that strange Neo Victorian look that so typifies steampunk style. And the best part? Anything that looks great as a steampunk decoration is fair game as a steampunk gift, so you can give your steampunk-loving friends and loved ones something that they will truly enjoy. 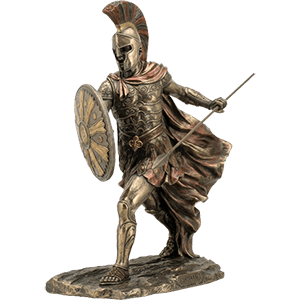 The heroes, deities, and historical figures of ancient Rome can be welcomed into your home when you shop our Roman statues and collectibles category. 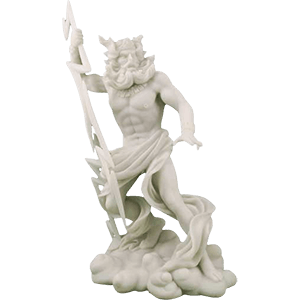 Here you will find all our high quality statues, busts, wall decor, and more featuring the gods, goddesses, heroes, emperors, and soldiers of Roman history and legend. We carry cast bronze statues of Fortuna as well as Roman chariot statues and statues of famous figures like Julius Caesar here. 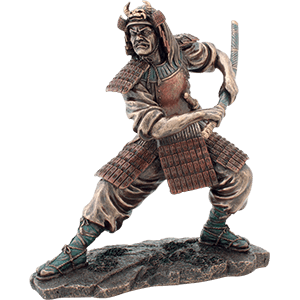 Our statues come in a range of sizes and finishes, some brightly colored and painted by hand while others have hand finished metallic tones. 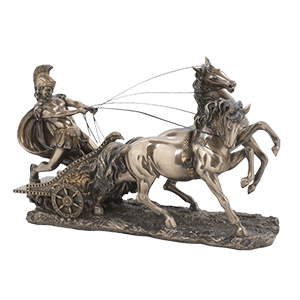 For those interested in Roman history or mythology, as well as those simply looking for an impressive addition to collections and home decor, our variety of Roman statues and collectibles simply cannot be beat! Originating in folklore and fairy tales, trolls and gnomes appear as two kinds of forest creatures, often living out in the wilderness or underground. 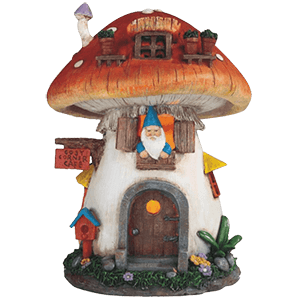 We carry a range of colorful troll and gnome statues and collectibles to decorate your home. 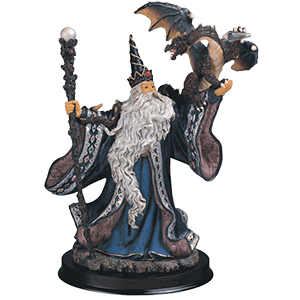 These fantasy creature statues show off various styles, including zombie garden gnomes and stylized fantasy trolls. Most pieces are carefully crafted from cold cast resin and then hand painted for a fantastic, detailed appearance. We also provide unique options like our wine holder statues that add a functional twist to their creative design. Take a moment to peruse the charming - and occasionally macabre - faces of these fantasy statues to find your next piece of decor! Have you ever wanted to see a Viking in action? Truth be told, it is not a common sight. But now you can not only see it, but immortalize that moment with a great statue or collectible! We carry a wide variety of Viking statues and collectibles that are perfect for decorating with, all of which demonstrate a stellar Viking design drawn from Norse history, lore, and legend. Some of our Viking statues depict the gods themselves, showing off the potential likeness of legendary deities like Odin, Thor, Loki, Freyr, Freyja, Frigga, and more. Some depict the gods during some of their more well-known legends, like Thor batting Jormungandr, while others depict the gods in a more traditional sense, showing their glory for all to see and enjoy. Other statues are dedicated to the men and women who worshipped them, depicting Viking warriors and shield maidens as they stand tall and as they battle. 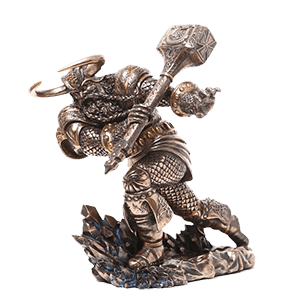 No matter the subject, though, these Viking statues are all made in quality materials like cold cast resin and cast bronze resin, while featuring an impressive level of detail that makes each one an impressive sight to behold. We also offer other Viking collectibles and home decor here, such as our variety of Viking wall plaques. You need not lack for Norse detailing or Viking decor when it comes to your mead hall or longhouse. Witches tend to get a bad reputation, and we are looking to dispel that. How, you might ask? Well, by offering a selection of traditional Wiccan items, which should prove, beyond a shadow of a doubt, that witches are not all as bad as they seem. 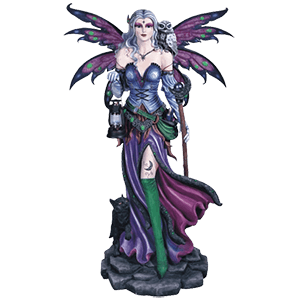 So why not take a moment and browse through some of our Wiccan statues and collectibles and see what witchcraft is all about? This section is filled to the brim with all sorts of clever little trinkets and decorations, which makes it a perfect place for those with an interest in Wicca to come, as well as a great place for those who are a little enamored with the classic lore of witches and witchcraft. You will not find any dangerous hex-bags or curses, although you might find some spell books, a few witch journals, and maybe even a ritual or two, although you can put those towards personal use. Speaking of rituals, we have a number of supplies to aid in your Wiccan ritual practices, including chalices, candleholders, and even spirit boards, as well as rune bags and trinket boxes to keep your materials safely together. 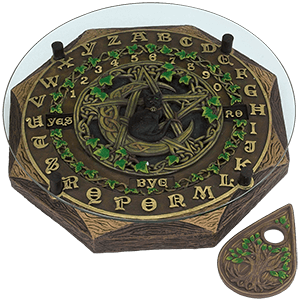 We also have tarot cards and rune sets for use in divinations, as well as various little bobbles and bits of home decor and Wiccan statuary, perfect for bringing a fantasy touch of bewitching style to your home. Collector, practitioner, or enthusiast, any of these will find that this Wiccan section will thoroughly satisfy their need for fine witchcraft items. Pay a visit to this section and prepare to be swept away into a flurry of great Wiccan statues and collectibles and items!